SenGuard marble & granite sealer represents the next generation in sealer chemistry. Utilizing nano-technology and super-small specially engineered molecules, SenGuard penetrates more deeply into your stone increasing the contact area for stronger bonding and more complete coverage. 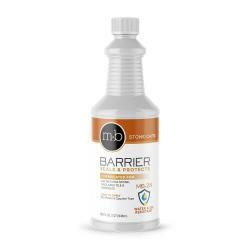 The result is a permanent protective barrier that chemically repels oil and water while still allowing your stone to breath providing the most durable, long-lasting stain protection available. COVERAGE: SenGuard will cover and seal far more stone per ounce than conventional sealers. One bottle covers an estimated 50 - 200 square feet depending on the porosity of the stone. Each stone is different and results may vary. Requiring only a single application using a lower volume of sealer means SenGuard is more environment-friendly than conventional sealers which require multiple applications of a large volume of sealant. 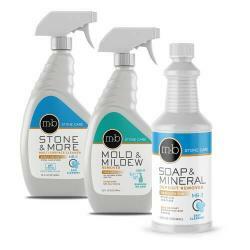 Use it for sealing granite countertops, floors, outdoors, marble, travertine and all other porous surfaces. It will not change the look or color of your stone and UV rays do not affect it, so it's effective for outdoor use as well. Your DIY natural stone countertop sealer kit includes a "how to" DVD video, step-by-step booklet, applicator and finishing cloth. Other top marble & granite sealer brands on the market today use fluoro-carbons, fluoro-Teflon or acrylic polymers to make very good sealers that in some instances offer 5 to 10 years of protection. However, these chemical compounds contain much larger molecules that do not penetrate as deeply or bond as well. In most cases, you will need to re-apply the sealer in 2 to 5 years. Now this is vastly improved from what sealers could do just a short while ago, but SenGuard is the next step in the evolution of sealer technology. SenGuard's cutting-edge sealer is engineered to provide permanent protection with only one application. It is more expensive. However, long-term it is the better value when you consider that you'll have to buy and apply any other sealer many times to get the same protection. SenGuard contains specially engineered modified silane polymer molecules. These molecules are thousands of times smaller than other sealer types. Thus, these molecules are able to penetrate far deeper into the stone and to spread into every pore, crack, fissure and crevice more effectively so you get more consistent and complete coverage. This is especially important for sealing granite countertops in the kitchen. These molecules are also engineered to form chemical bonds directly with the stone that are as strong as the bonds holding the stone itself together. When applied to granite or marble, etc. a reaction takes place. Part of the molecule is attracted to water, so it is drawn into the stone by water molecules in the stone. The specialized molecule then breaks apart while displacing the water molecules. It leaves behind a hydrophobic and olephobic molecule that binds directly with the stone lattice. The remaining molecule chemically repels oil and water like opposing magnets repel each other. Other marble & granite sealers rely on weak hydrogen bonding and mechanical holding (clogging the pores). SenGuard becomes part of the stone itself while still allowing it to breath, as it should and doesn't change the look or slip-resistance of the stone. The net effect of this reaction is to change the "surface energy" of the stone. All materials have surface energy. A low surface energy liquid like oil will penetrate a high surface energy material like granite. The molecular bond created with the stone by the SenGuard sealer changes the surface energy of the stone so that it becomes lower than oil or water. Thus, when you spill something, instead of the stone quickly absorbing the liquid like a hard sponge, it just beads up on top of the stone dramatically delaying absorption for easy cleaning. Application: One bottle of SenGuard will cover an estimated 50-200 square feet depending on how porous and absorbent the stone is. Every stone is unique so results may vary. It's important to let the stone absorb as much sealant as possible (without letting it dry on top) rather than trying to spread the sealer around to cover as much as possible. One properly applied coat is much better than two thin ones. 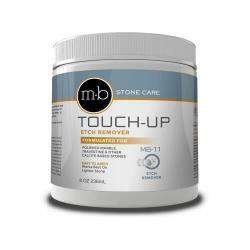 Also, depending on the porosity of the stone two coats (or even three for very porous stones) may be necessary to properly seal the stone in one application. Simply perform the water test (click here) prior to application to determine how porous your stone is and estimate the possible necessity of a second or third coat. Performing the water test after the first coat has cured for 24 hours will help determine if the stone is effectively sealed or if a second coat is necessary. Performing a "test" application on a left-over or sample piece of the stone to be sealed is also advisable to help determine the coverage required for an effective application. Sealer Myths: It's important to understand that many myths and misconceptions abound regarding sealers and sealing granite countertops. No impregnating sealer will "absolutely prevent" a stain. Sealers work by radically reducing the rate of absorption of a stone. So, the advantage of applying a sealer is that it allows far more time to clean up a spill. If neglected, a liquid exposed to the surface for an extended period could still potentially stain no matter what type or brand of sealer used. The advantage of applying SenGuard is that the permanent bonds will not break down with use and exposure to cleaning products like other sealers, so it remains effective while others sealers will require regular re-application. 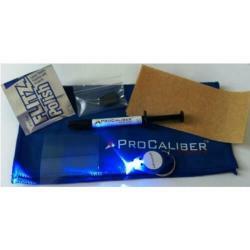 For complete, detailed information regarding sealers and sealer application please consult the All About Sealing ebook. Chemical Etching: SenGuard sealer will not protect against chemical etching by acidic compounds. No impregnating sealer will prevent chemical etching that leaves dull and light-colored spots on calcitic stones like marble, travertine, limestone and (rarely) some granites. Free Shipping: You will not be charged shipping costs on the SenGuard product which ships separately (per manufacturer) from all other products. However, a handling fee may still apply and shipping costs for any other product ordered will still apply. This product ships to addresses in the contiguous US states only. SenGuard cannot be shipped to Hawaii, or Alaska. I received the product earlier than expected and already put to use. Great product! I would just like to say how ecstatically thrilled I am with your product. We recently purchased a home and it had the darkest and cheapest granite in the kitchen and bathrooms but that wasn't the worst part. We discovered after we left a bottle of mouthwash on the bathroom granite that it was never sealed because the chemicals from the mouthwash seeped from the bottle into the granite! So we decided that even though we didn't like the granite we could not afford to replace it so we had better protect it until we could replace it. We chose your product to use. I could not believe my eyes. Not only did it make the granite shiny but now nothing sticks to the granite and it actually appears brighter. I can see reflections in it so it looks lighter since the items reflecting are light. This is amazing. Oh, yes, and it is very well protected as well. I am happy to tell everyone about your product and will purchase it in the future if I ever need to protect granite again!!! Thank you for your product! I had new granite countertops installed recently. My kitchen is the sole focal point in the house so protecting my investment is the highest priority. I purchased the installation from a box store with the promise that they were adequately sealed. Within days I saw the dark spots where water was penetrating. I did my homework and found Senguard to stand alone in a class of its own, providing the best protection available. I finished sealing them several days ago and see a remarkable difference already. Water beads up and does not penetrate. Easy to apply. Make sure to have good ventilation as it is a very strong smell. Applied it to a tile/grout shower and it worked fine. +++ COUNTERTOP SPECIALTY COMMENT: Thanks for your feedback Jim. Yes, all sealers have a smell, however, the smell will dissipate quickly with open windows. And no smell once the sealer is cured. Very easy/ great protection! We just installed new countertops that I wanted to protect. Instructions were easy to follow. It didn't take a lot of time to do. Water doesn't soak in now. We had light granite and even though the installers sealed it, it seemed to stain a lot. We were very worried. Found this product, sealed my counter and a piece from the cutout sink 2 days ago. Tested a mix of turmeric, cinnamon, and water on the extra pieces. Left it for 6 hours and it came up with not trace on the granite. Super happy with Senguard sealer! I purchased SenGuard sealant from your company. You were the only retailer who had it in stock. The only sealant I can purchase at a store I would have to reapply every 3-5 years. That is something likely to be forgotten. I am happy to have found a single application product. You filled and shipped my order quickly. Thank you. Amazing sealant! Kit comes with everything you need to seal your marble. Application was easier than it sounded and the little bottle covered much more granite and marble than I expected. It exceeded my expectations. How many products can you say that about? We applied SenGuard to our new kitchen granite counters 3 years ago and it was the smartest thing we have ever done. We have had many foods that stain, like beet juice, not leave a mark and have cleaned with just a damp cloth, no soap, no polish, no anything else. Not a mark, not a water stain even where it sits by the faucet. I think it has paid for itself in just the savings on 6 month reapplications of regular sealer. We are about to buy another bottle for our new bathroom counters. The product went on extremely easily and quickly. Our stone (Cosentino granite) accepted almost none of the SenGuard liquid. It remained looking "wet" for quite some time when applied, leading me to think the stone had very little porosity. Cosentino sells the Sensa Stone which is sealed with this product in production. We did not purchase this, as the price is much higher; however, I wonder if we accidentally got that stone. Still, it did add to the luster just a bit. As a result, we have quite a bit of sealant remaining. This is the best sealer ever. Easy to apply. Super results. I purchased the Senguard Permanent Marble and Granite Sealer 2 years ago. I must say using the product was very easy apply. I wanted to take a little time to say thank you for your wonderful support and service. 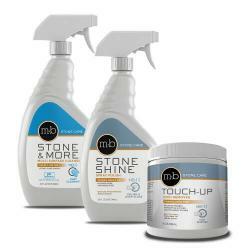 I ordered sen-guard marble sealer and used it in my new shower and this is a wonderful product! Easy to use with great instruction! Thanks agian ! Do not buy this stuff. We installed it on our brand new marble tops and followed instructions to a T. Four days later, we several ring stains from WATER!. No liquid beads, it all adsorbs immediately into the top. We have requested a refund from the company. =+=+=+=+=+=+ COUNTERTOP SPECIALTY COMMENT: We did consult with this customer after leaving this review to diagnose the issue and provide guidance. According to photos provided by the customer the "stains" were actually etch marks which sealers cannot prevent. Also, a sufficient volume of sealer had not been applied.The stone must be allowed to absorb as much sealer as possible until saturated. In some cases, 2 or 3 coats are needed to effectively seal the countertops and achieve maximum time to absorption / stain resistance where water readily beads on the surface. Seems expensive until you consider what you paid for your granite countertop in the first place. Isn't it worth the best. This product seems worth the price. We ordered Senguard sealer for our newly installed granite and marble stones in our kitchen and bathrooms. The transaction went through smoothly. There are clear instructions on how to apply the sealer and the actual application was pretty straightforward. The added protection makes it much easier to maintain the stones against usage stains. I was looking for a product to seal very porous granite. 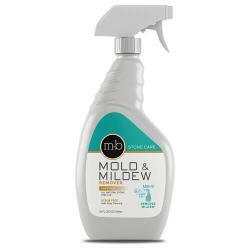 This product did the job! Would definately recommend. 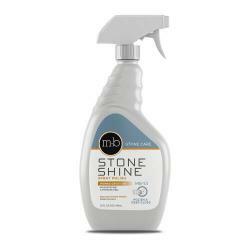 I used this product on installation of tumbled travertine in a shower. So far, the product did exactly what we wanted. It left no shine or residue on the stone and we are hoping it will reduce mildew due to its nano chemical bonding properties. Your method of answering questions online by a ticket number is very efficient. Recently bought and applied the product and so far, seems to work exactly as advertised. P.S. Note that you should follow instructions re using a breathing mask/filter when applying...this stuff has a powerful/toxic, smell/impact. 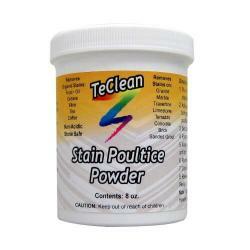 -- Jonathan Cohen ++++++++++ CTS COMMENT: Yes, all sealers have fumes similar to acetone or nail polish remover. In most cases it is sufficient to simply open windows to provide good ventilation during application. Fumes quickly dissipate as the liquid part of the sealer totally evaporates and the sealer cures. Once sealer cures it is completely inert, non-toxic and safe for food prep. I bought 2 bathroom vanities with granite countertop. I applied Dupont sealer bought from Lowes on the 1st countertop and it did not work, still leaving the dark marks from water. I purchased Senguard sealer and applied on both countertops. Application was quick and easy per the video instruction. The second countertop which never had the Dupont sealer was complelty sealed with Senguard. The first countertop which I applied the Dupont sealer before still has a lightly dark spots if having water for more than 5 hrs. I applied a second time with Senguard sealer but the problem still persist. But it was improved a lot. Maybe the Dupont sealer prevent Sendguard sealer from completly penetrate the pores. I might seal a third time with Senguard. +++++++++ Countertop Specialty Comment: Thanks for the feedback Linh. Taking 5 hours to absorb water and darken after sealing is excellent. The granite is sealed. Sealers do not form a shell over the stone. Sealers dramatically increase time for liquid to absorb giving you more time to clean. 5 hours is a long time. Anything over 30 minutes is considered effectively sealed. I applied Senguard to Giallo Veneziano countertops. Before they would immediately absorb water. After, they take at least 15 minutes to absorb water and the water initially beads up. I did 3 coats. The small bottle goes a very long way! I feel much better about my granite and travertine backsplash being safe. I received great service and after-order email assistance on two orders and appreciate it very much. I would like to ad, your product is amazing! It was simple to put on and looks great! I agree the bottle is small but it easliy covered my entire kitchen, including a large island. I have plenty left to do the granit on my bathroom counter. The prep and application was extremely easy. I asctually went over it all three times. Once done, I later applied a stone polish. The counters look great and the water beads up very nicely. The only thing I do not know is how long this will last. I hope it is as advertised...forever with properroutine clean up. WOW be prepared for a shock. This is a very little bottle. I haven't tried it yet, but was shocked at what I got for $150. It's tiny with a couple of cute falsies and a dish cloth. WOW. I will report again after using the product. The $148.99 is not based on volume compared to other "common" sealers. The price reflects the advanced chemistry and permanent bonding, which no other retail sealer provides. The kit is designed specifically for DIY use to seal one average sized kitchen countertop (avg = 50 sq ft.). The bottle is 12 ounces and covers/seals 50-200 sq. ft. of stone as prominently noted in the product description. For any sealer "coverage" is the relevant measure... not volume. Senguard covers/seals 40% more than standard sealers, so you need a lot less volume. In this aspect a more "green" product. Also, it is far cheaper than having a pro apply it for $400-$500, which is the only other way to get such superior performance. Cheers! I recently purchased SenGuard Permanent Marble & Granite Sealer from Countertop Specialty. The website was easy to use and the product shipped right on time. I had a question about the product after receiving it and their customer service answered promptly and was very helpful. I plan on doing more shopping at Countertop Specialty. This product is great. One time application and no worries for many years!! I purchased SenGuard Permanent Marble & Granite Sealer. It went on easy and is providing great protection! My Typhoon Bordeaux granite was treated after it was installed by my contractor (5 minutes to apply and wipe excess). He stated that SenGuard is the Best sealer product he's used in the past 12 years! After my $$$ countertop investment, if he hadn't, then I surely would have!!! Awesome product! I only had to apply it once on my countertop and that was it. No more sealing AT ALL! !